The investiture ceremony took place at Buckingham Palace on 4th April, where the award was given by Prince Charles. 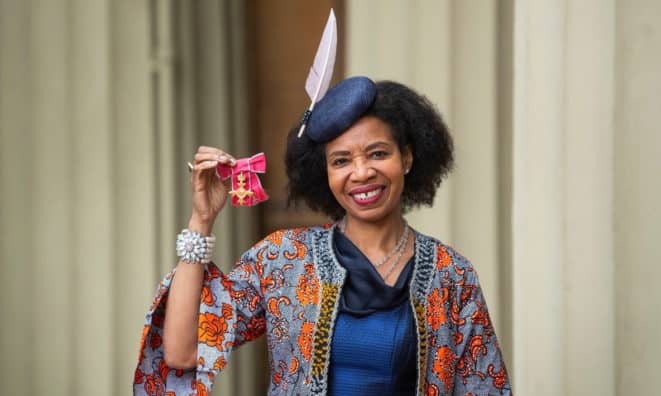 Shirley is an active member of The Ivors Academy, currently sitting on the Academy’s Classical committee, and is involved with a number of the Academy’s initiatives and working groups, including an ongoing diversity and inclusion campaigning project in partnership with BBC Radio 3. As a composer, visionary artist, cultural activist and music educator, she has composed extensively for concerts, TV, film, theatre, dance and opera productions worldwide. Projects include the extraordinary New Nation Rising, A 21st Century Symphony, originally commissioned for the Queen’s Golden Jubilee in 2002, which was performed and recorded by the Royal Philharmonic Orchestra for nearly 200 performers. Other best known works include the contemporary dance production PUSH, produced by Sadler’s Wells, which toured for 15 years to over 50 international opera houses, as well as the highly acclaimed opera series, Heroines of Opera, a collection of multi-media stage works for solo voice, speaker, dancers and chamber orchestra, where Shirley creates epic female heroines, subverting the usual roles of femme fatale and tragic heroines for women in opera. Upcoming events include Shirley’s commissioned new work, Legend of the Phoenix, for the United Nations/Hear Her Song/Canales Project tour with performances at the National Gallery, Washington on 12th May, Hammer Theatre, San Jose on 19th May and Wolverhampton Arena on 21st and 22nd June. Shirley has composed a new choral work, London Calling, to commemorate the 170th Anniversary of Queen’s College London, thought to be the first female-only college in the world. The work will be performed by the RPO with Queen’s College junior and senior choirs on 24th June at Cadogan Hall.